At Shredder Waste Paper, we’re committed to both protecting the environment and ensuring your business complies with the latest legislation. 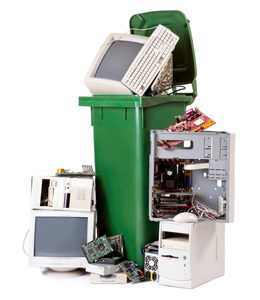 Under the Waste Electronic and Electrical Equipment Directive (WEEE), all redundant and broken electronic equipment must be processed and recycled. This is to reduce the amount of non-biodegradable material and heavy metal going to landfill. We can help you meet your responsibilities as set out by this directive. Our secure IT disposal service takes care of your old computers, monitors, hard drives, printers and scanners. We’ll collect them for destruction and recycle parts where possible to prevent them from ending up in landfill. Whether you have one unit, several units or pallet loads of electronic equipment, we’ll collect it all and dispose of everything efficiently and legally.